Have I mentioned yet that we have a new Lisette pattern out for spring? No, I didn’t think so. After staying up late for two nights in a row to finish my new Lisette Attache Dress (Simplicity 1666), there was no way I was going to let a little problem like being alone in the studio yesterday with no one to photograph it stop me from showing you! (It’s been a quiet week in the studio, which has allowed me to make some terrific progress on next spring’s Lisette fabric collection.) The envelope for this pattern doesn’t do the dress justice, so I wanted you to see it on someone. That would be me, I guess. This dress is so easy to make, especially since there are no sleeves to set in, and the princess seams make it easy to get a nice fit. You can take a little in here or there, as necessary, to tweak it for your own shape. This is a semi-fitted dress, which means that it’s designed to fit closely to the body but not tightly. It should skim the body, not restrict it. It’s also very flattering because of the built-in cap sleeves and the shaping. The cap sleeves and flared skirt really help give the illusion of a tiny waist! I know some of you really like to wear a belt, and here’s a photo to show you that it can be done with this dress. I sewed my Attache Dress from raisin-colored wool crepe because I didn’t want to wait until spring to wear it. I love sewing with wool crepe. It’s so forgiving and drapey. I lined my dress, which is why it took a while to sew. The pattern doesn’t include a lining, but it’s easy enough to add one. I plan to wear this with jackets and sweaters, and it’s been fun to pair it with boots and tight in this cold weather. I’ll swap them out for other accessories as the weather warms up. 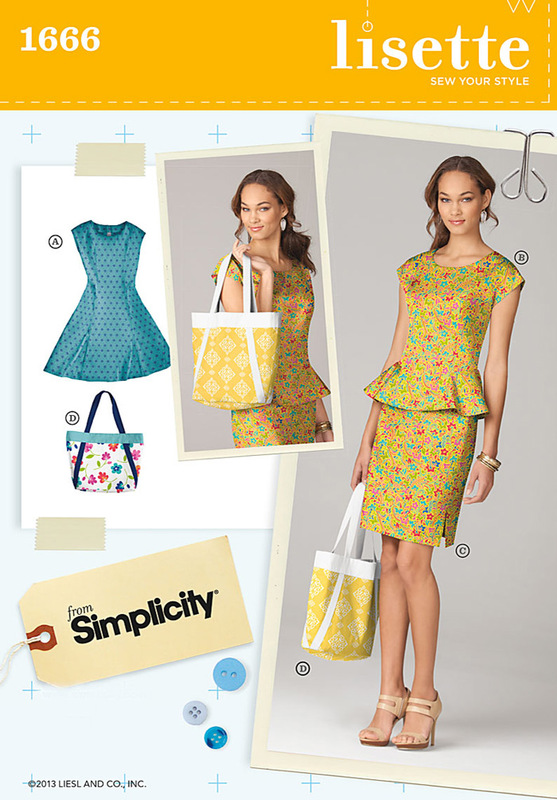 I just finished cutting out the peplum top from this pattern in one of the new Lisette fabrics, too. If I manage to finish that new Lisette fabric collection and get through next weekend’s big birthday party (theme: pink, number of little girls: 6, number of craft projects planned for the party: 3, number of things I need to finish before the party: 37?) I’ll sew it up and show it to you soon. At this rate, who knows when I’ll get to the skirt or the bag patterns that are also included in the envelope! This will be my dress this spring! This is exactly the kind of shape I want to wear to teach to my class. Not too formal, but well dressed. Tried to pick it up today, but my Joann didn’t have it yet. Love it. So happy you posted this. I love your patterns and was going to buy it on good faith that it would turn out awesome, but you are right. The envelope does it no justice. Super cute. I will second Samantha…the envelope doesn’t do the pattern justice. I love the dress. It has a great shape to it. I can’t wait to get my hands on the pattern. I love your patterns as well! i recently just made 2 bags from the lisette 1905 patterns. can’t wait to try the dress and bag from this pattern one day. I just bought a Vogue pattern with a peplum. I think I’ll do yours first as your instructions can’t be beat. Can’t wait to make this dress, looks great in the color you chose, I have the perfect print to make for spring, thanks for showing it. I really think they should re-do the pics they used for that pattern. If I had not seen a pic of the dress on you (and in a solid color) then I would have never even thought to purchase it! It is lovely! Pic A on the pattern envelope looks horrid! This is a cute dress! This was on my list too but Joann’s doesn’t have it yet. I wonder when?? This is a cute dress! This was on my list too but Joann’s doesn’t have it yet. I wonder when?? Looks great on you! I have not made any garments in years, this pattern is so cute that I think I will give it a try again…next shopping trip I will get this one! Just lovely! This dress will be very flattering to my body shape, I think! Anxiously awaiting spring……. ps Good luck with the party organizing! Wow, Jennifer – I’ve never seen anything from Liesl that looks “horrid”. How amazingly rude of you to say so. I love it — is there any place I can purchase the sleek figure and luxurious hair as accessories? Inquiring minds want to know! Oh yes, I need those accessories, too! Beautiful dress! Can’t wait til my local store has this pattern! this is a beautiful dress. i look forward to sewing it. i am in my 60’s and this is a good style for me. thanks again! That’s a beautiful color on you. I’m wondering if you’d share where you found it. I’ve been looking for something like that too. Would love to know more about how to line it.